Everything’s finally coming up spring around here, you guys! (Read: I’m totally ignoring the snow forecast for today.) We planted our first herb garden ever over the weekend and hung up string lights on the balcony. We had our first meal al fresco and the husband went for his first bike ride of the season (my bike is soon-to-be in transit from my parents’ house… I’ll see you soon, sweet friend!). My freckles are making a comeback. And I’m getting on a spring-induced health kick. Don’t worry — I’m still planning a fair share of posts of the cheesy, sweet and all-around not-good-for-you-but-oh-so-tasty-for-you variety. 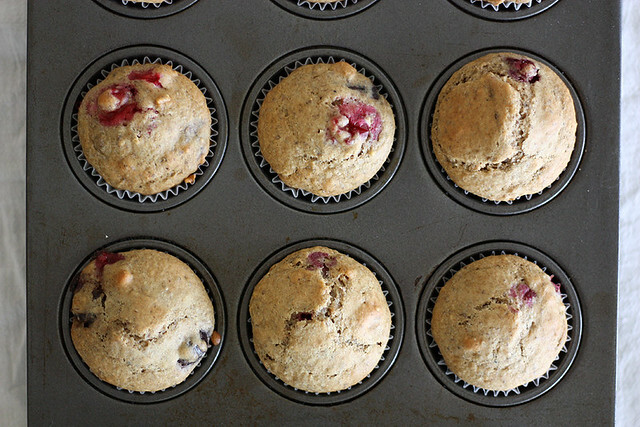 But for now, can we talk about muffins? 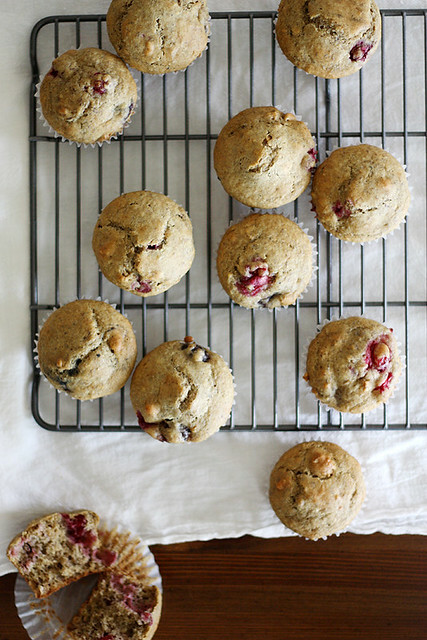 Specifically, healthy vegan muffins? With cranberries and cherries and granola inside them? K thanks. You won’t be sorry, I promise. Because these muffins? They may look and sound healthy, but they definitely don’t taste like it. Really. I know a lot of people will tell you that their healthy muffins don’t taste healthy, only for you to bite into one and realize it actually tastes a lot like crumbly cardboard. Then you have to smile and nod while your mouth is dying a slow death induced by dry cardboard mouth-chewing and it’s awkward. No no. These are not those muffins. But they’re not those gargantuan, streusel and glaze-topped banana nut muffins you find at the grocery store, either: the ones that taste so amazingly delicious but also like you’ve just eaten your daily allotment of fat and calories and sugar for the day. No no. These muffins are a happy medium. They are soft and light, flavorful and filling. They maintain a solid balance of tartness, sweetness and crunchy texture. And they’re absolutely perfect for eating for breakfast out on the balcony with a hot cup of coffee on the side… especially after a night of eating too much queso fundido. Ahem. I’ve dabbled in vegan baking before (a.k.a., baking without eggs, dairy, butter and other animal products), but usually it intimidates me. That said, I’m willing to take on the challenge if I know the end result could potentially reward me with delicious baked goods that won’t leave me feeling gross. And these muffins couldn’t have been more rewarding. Now if only I made a double batch; I need something to munch on to take my mind off the fact that it MIGHT SNOW TODAY. Oy. 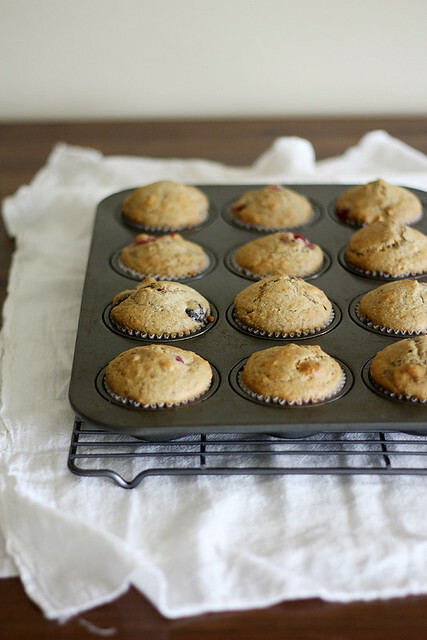 Heat oven to 350 degrees F. Line a 12-cup muffin pan with paper baking cups; spray lightly with cooking spray and set aside. Whisk together milk and apple cider vinegar in a measuring cup or bowl; set aside. In a large bowl or bowl of a stand mixer, whisk together flours, flaxseed meal, baking soda, cinnamon and salt. In a separate large bowl, whisk together maple syrup, vegetable oil and vanilla; add milk mixture and stir to combine. Make a well in the center of the dry ingredients; add the wet ingredients and stir until just combined. Fold in cranberries, cherries and granola. Divide batter evenly among muffin cups. Bake until golden brown and a toothpick inserted in the center comes out clean, about 20 minutes. 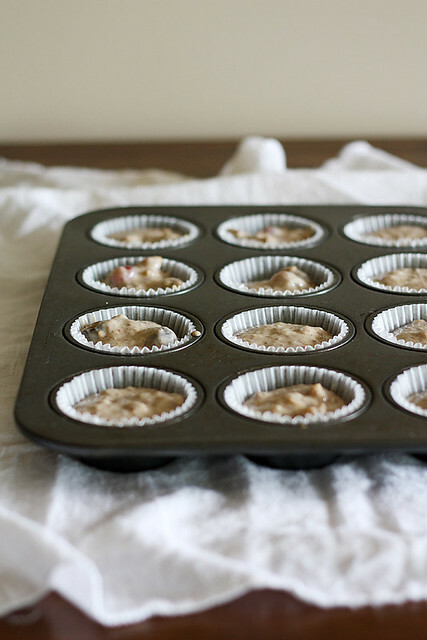 Remove from oven; cool muffins in muffin pan for 5 minutes. Remove from pan and cool completely on a cooling rack. Finally! some one has said it! I am still do not believe that all these recipes with the labels of healthy, gluten free, sugar free etc. can THAT great. While eating healthy is great, I would rather go without than eat 100 rubbery oat balls that are call cakes. Lovely vegan take on a mufffin, I find they are only recipe that have been property “veganised” to still taste good. “then you have to smile and nod while your mouth is dying a slow death induced by dry cardboard mouth-chewing and it’s awkward” lol you are so funny and oh so right! Haha these look awesome and nothing of the dry cardboard sort! Tieghan — Thank you so much, dear! Jessica — Haha, funny but also, true 🙂 Thank you! You have me intrigued! I love the cranberry/cherry combination! No snow here yet. Hope it status that way! I can almost smell them through my screen! Now if only I could grab a few through it too!! :) Pinning! Granola IN muffins! Humm… sounds like a great use for my homemade granola! These sound absolutely delicious! Definitely going to be trying — I’ve been experimenting more and more with vegan baking lately, so these are totally happening! Anna — Wouldn’t that be nice? 🙂 Thanks, dear! Reba — Yesyesyesyesyes, especially homemade granola! YUM. 🙂 Thank you! These look delicious! I’m definitely going to bookmark this page and make them when I have time. Lisa — I know, I hope so too! So far so good. 🙂 Thanks! I have been the victim of too many dry and tasteless vegan muffins but these look nothing like that! You have no idea how happy that makes me. Aren’t vegan muffins just the best?? I love them! Claire — YES!! Me too 🙂 Thanks, love! Beauties! I want to reach through the screen and grab one :). Kate — They really are! 🙂 Thank you! These sounds so good! I love that they are vegan and refined sugar free too! I’ve been venturing into those areas more myself lately. I will definitely have to give these a shot. Ps, I love my flour-sack towels. looks like you do, too! These sound so good – I love the combination of flavours that you’ve used and they look so lovely and light and fluffy…so not what I expect from a vegan muffin! Stephie — Haha, I do love those towels! 🙂 And yes, granola in muffins = tasty tastiness. Thanks, friend! Vegan baking kind of scares me. Usually the list of ingredients is redic! This list is actually manageable. Eating vegan every once and a while makes me feel like I was just rebooted, a little start over. 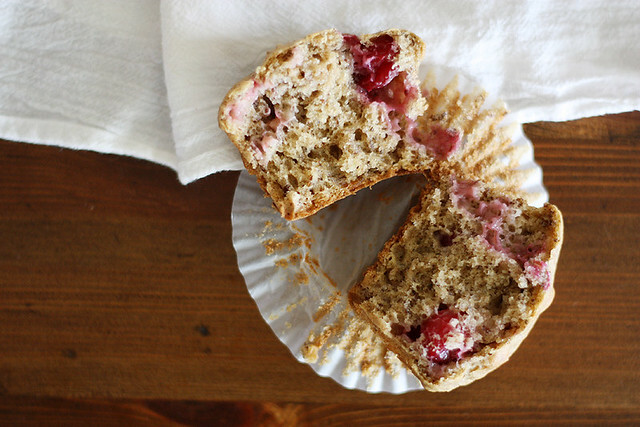 These muffins looks like the perfect breakfast on the go! Stefanie — I agree! 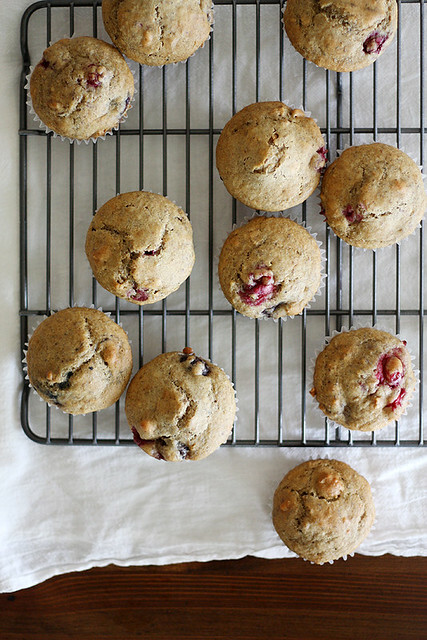 Love a good rebooting muffin without a laundry list of ingredients. 🙂 Thanks, lady! I’m totally down with your spring health kick. These look delicious! BTW, love that your freckles are coming back! So are mine. I love this time of year! dishing up the dirt — Freckled girls unite! 😉 Thanks, dear — happy weekend! I really don’t eat many muffins because they’re either too blah or too crazy decadent…no happy medium. Until now. Love. Joanne — Totally agree with you… these are definitely a happy medium! Thanks, dear! Hey Stephanie, these look great. We’re always looking for yummy breakfast ideas!